Own the original 24 x 36″ painting of the Golden Eagle Goddess with real gold leaf and such beautiful delicate details that can only be admired in an original. This winged goddess was the centerpiece and culmination of my series “Spirit Animal: Goddess”. 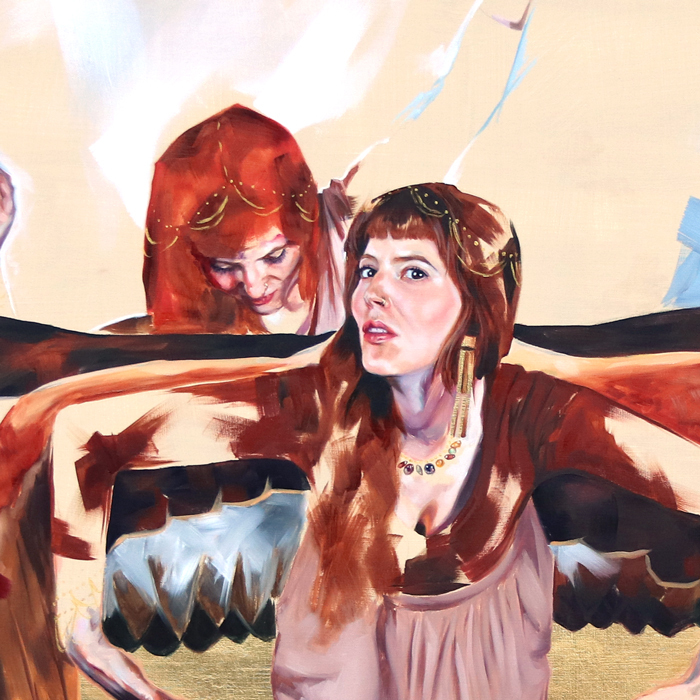 Own the original 24 x 36″ painting of the Golden Eagle Goddess. This painting is the culmination of my series “Spirit Animal: Goddess”. I feel like it achieved everything I was hoping for in the entire series — beautifully developed hands, and faces, fine detail paired with grand gesture, movement, etherealness, and a feeling as though the goddess isn’t fully rooted in this world and is coming through the mist. Oil, 24k gold, and metal leaf on panel. The majority of the painting is done in oils with the exception of the gold leafing on the lower half of the painting and her earrings. This is made from 24k gold leaf and metal leaf to give it a variance in the gold’s texture.